Roasting is a cooking method that uses dry heat, whether an open flame, oven, or other heat source. Roasting can enhance flavor through caramelization and Maillard browning on the surface of the food. Roasting uses indirect, diffused heat (as in an oven), and is suitable for slower cooking of meat in a larger, whole piece. Meats and most root and bulb vegetables can be roasted. 1. preheat the oven at 375C. 2. Season the chicken with salt, pepper, and rosemary. Rub thoroughly with butten and lemon juice. 3. In a hot pan, sear the chicken until golden brown in color. remove the pan from the heat. 4. Place the diced onion, carrot, and celery onto the sides of the pan. position the chicken at the center of the pan. 5. Transfer the pan to the oven and roast the chicken for 30-45 minutes or until cooked. 7. For the potatoes, toss in olive oil with salt and pepper. 8. Bake with the chicken for about 20 minutes or until crisp and golden brown. 9. 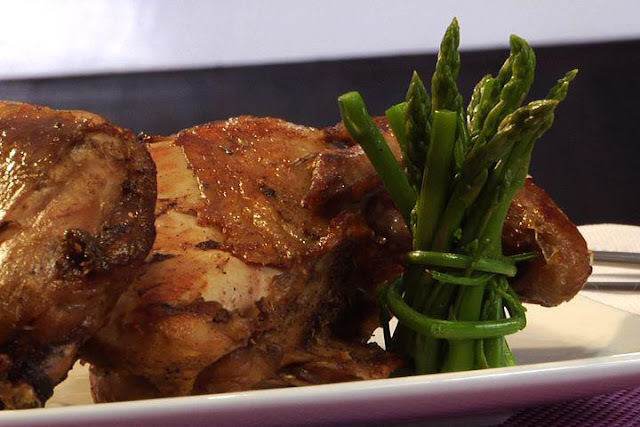 Plate the chicken with potatoes and garnish with asparagus.